Festive Fridays - Shake it Up! | Midnight Crafting Midnight Crafting: Festive Fridays - Shake it Up! Its that special Friday again -- a FESTIVE FRIDAY! Festive Friday is a Blog Hop happening every other Friday, showcasing Christmas projects. The goal is to work on a few Christmas Cards a month, so when crunch time rolls around come November, we're all not too weary to get cheery! If you're joining me directly, you will probably not want to miss the begining of the hop over at Terris blog. If you've joined me from Brendas blog, You're hoppin' along just fine! This card really begins at the Scrapbook Expo last month. I took a class in techniques, and got a free box of Mica flkes. As you all know, I dislike beyond all reason the glitter (said with a sneer)!! SO I was not keen to try this stuff out - big chunky glitter! But I will admit that its not all bad, and not much like glitter. "Flashy Fishfood" was how my instructor phrased it, and that about sums it up. 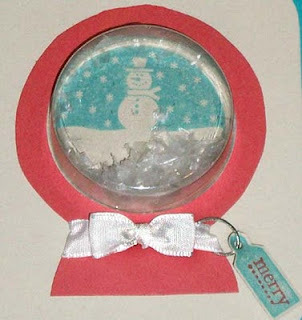 The small 1oz box I have will probably do me fine for the next 5 years, unless I go crazy with the snow globe cards for Christmas... but they require extra postage to mail, so that unlikely! The mica makes for some Perfect snow in the snow globe though! I've always wanted to try this style card. For info on this card, keep reading... if you'd like to be sure to get to everyone on our Blog Hop please continue on to the wonderful Yolanda over at Crafty Scentiments. 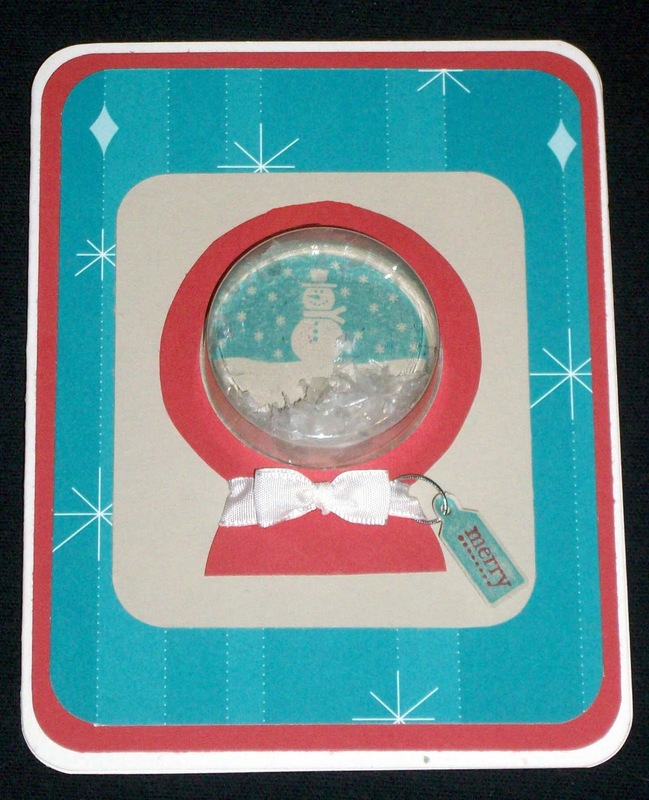 layer of solid card stock 5.25 x 4.0"
layer of Designer Series Paper ﻿5.0 x 3.75"
odd scrap of solid cardstock 3x3", punch hole and hand cut outer ring for globe, draw & cut "base"
Mica Flakes - optional, also can use punched paper bits from your hole punch etc. Layer your bases and center your globe design punch where you like, I tried to center mine. Adhere. Punch your "outer rim and base" paper and craft the globe stand. They make stamps for this I'm sure, I have to get one...layer the centered base outline on your solid layer and punch again to make another matching hole, if you'd like to try both layers be my guest - but I will tell you that your probably going to break your punch! Now, tip a bit of your Mica or confetti into your Sweet Treat Cup and remove the adhesive protector strip. These cups are self adhesive, and strong! Holding the cup so as not to dump mica on yourself, line it up with your design on the card and stick it. Then add your covering layers - the cardstock, and then "base". If you're adding a cute embellishment - ribbon, twine, tags - do it before you adhere that "base" on. Then dust yourself off, make sure all that darn fishfood heads to the cleanup bin, and enjoy your card. This is not a 10 minute card, and may be a frustrating 30 minute card depending on your dexterity with the snow globe layers. But, it is a cute idea and can even be done so that your reciepient can Open the treat cup. Then you could fill it with treats (hah! ), or a little gift or something. I've seen these cute cups filled with goldfish, buttons, gumballs, and chocolate! This could make cute stocking stuffers filled with mints or candy. Enjoy and see you back in two weeks for another FESTIVE FRIDAY! nice! I love the globe look! Love shaky cards! 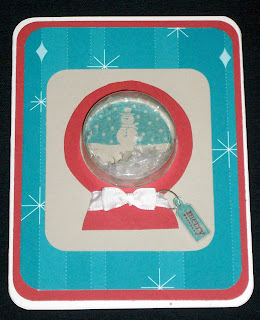 I also love snow globes GREAT CARD! You did a great job. I may have to try this one soon. Angie you really hate glitter oh my i love my stickles, couldnt do without them ...oh well love the card gonna have to get some of those cups what a fab card!!! !